RBTH presents a selection of views from leading Russian media on the latest developments in Ukraine, featuring reaction to the new law passed by the Verkhovna Rada awarding ‘special status’ to the Donbass for three years, as well as an act on the 'purification of the government' and the ratification of Ukraine’s association agreement with the EU. On September 16 Ukraine's parliament, the Verkhovna Rada, passed a law giving the breakaway regions of the Donbass controlled by pro-autonomy militias special status for three years. This entails broad local self-rule, the right to have their own people's militia, economic support and the right to use Russian as an official language. Gazeta.ru reports that the law, as expected, caused fury among the deputies who support a continuation of the “anti-terrorist operation” until victory is achieved. The head of the Radical Party, Oleh Lyashko, called the vote for the bill "the scam of the century," while the leader of the nationalistic Svoboda Party Oleh Tyahnybok labeled it a "capitulation to Russia." Nevertheless, according to political analyst Alexei Makarin, Ukraine had no alternative: If the “anti-terrorist” operation had continued, "Ukraine would practically have had to fight Russia, and for this it does not have the resources." Gazeta.ru also reports that the law was welcomed in Moscow, but has created a schism among the leaders of the breakaway republics. Prime Minister of the unrecognized Lugansk People’s Republic Igor Plotnitsky said that the law "satisfied the militias' requests in general." Meanwhile many field commanders reacted negatively to the implementation of the Minsk agreements, considering them a betrayal of the people who had fought and died for the region's independence. Expert Magazine also emphasizes the difficulty in implementing the peace plan, as well as its indistinctness. It is still not clear, for example, which territories exactly will have special status. "Most likely it is only a protocol about the intentions, and not the law itself," Expert cites political analyst Alexei Martynov as saying. Martynov also believes that after the elections to the Verkhovna Rada, which, according to experts, will be filled with supporters of the war, the peaceful initiative may be delayed or even annulled completely. On the other hand, the introduction of the initiative is in itself a positive sign. Besides the law on special status for the Donbass, on Sept. 17 the Rada also voted on the law on "the purification of the government." This law was passed only after the third attempt. Kommersant writes that the act involves the examination of "individuals empowered to carry out governmental functions or those of local self-government," which means virtually all officials. Those who held a post from February 25, 2010 to February 22, 2014 - the period of Victor Yanukovich's presidency - "are declared in advance not to have passed the exam" and can be dismissed from their positions. Moreover, in accordance with the new law, those considered unreliable are former leaders of the USSR Communist Party, "individuals calling for separatism," and "individuals whose activity or inactivity led to the infringement of human rights and primary freedoms." Kommersant cites Ukrainian political analyst Dmitri Djangirov, who considers the document "a real weapon for taking revenge on those who opposed Maidan and its representatives," as well as "a career suicide for many representatives of the Ukrainian government," since in the case of a broad interpretation of the law, it can be applied to an overwhelming majority of today's important officials. Rossiyskaya Gazeta comments on another act passed by the Verkhovna Rada yesterday: the ratification of the Association Agreement with the European Union. 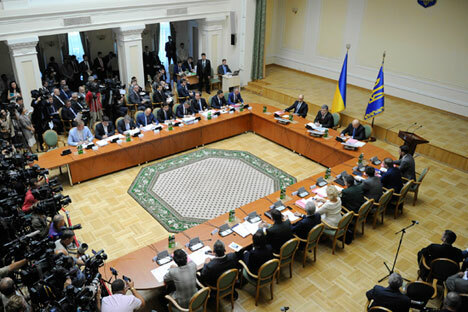 "Practically all the speakers spoke about the enormous political significance of the vote, of inevitable future reforms, of Ukraine's uniqueness, which is understood by the EU," writes the newspaper, reminding its readers that the actual implementation of the agreement has been postponed until 2016, something that the Rada "did not wish to remember." The postponement is related to the fact that the Ukrainian economy would probably not be able to withstand an immediate implementation of the agreement - the domestic market would collapse under the influx of duty-free goods from Europe. The EU Parliament ratified the agreement contemporaneously with the voting in the Rada and the European Commissioner for Enlargement and European Neighborhood Policy Štefan Füle explained that the agreement's postponement is due to a request from the Ukrainian side.